With the holiday road trip sufficiently behind us, I can go back to meal planning. Last week I went to the store at the last minute, without planning, because we needed food RIGHT NOW, and so our meals were a little less satisfying than usual. This week I will be gone most evenings, leaving the hubby to fend for himself. But I don’t like to leave him to fend for himself since that usually means he will end up eating pizza. He is fine with that, but I am not. So as has been typical of the past month or two, I have been cooking more on Sundays so that there are plenty of leftovers in the refrigerator for him to choose from throughout the week. And to save time, I have been plugging in at least one crockpot. When the crockpot is done, the contents immediately go into the refrigerator for later in the week. Spicy Black Bean Chili with Green Chile-Cheese Tamales and Salad – chili from Fresh from the Vegetarian Slow Cooker. Tart-Hot Kidney Beans with Broccoli and Rice – the bean recipe is from 660 Curries. And if I get motivated, Bhaakar (flatbread) too. Make-Your-Own-Pizza – on an Udi’s crust. Chickpea Stew with Sweet Onions and Salad – chickpea stew recipe from Lorna Sass’s Great Vegetarian Cooking Under Pressure. 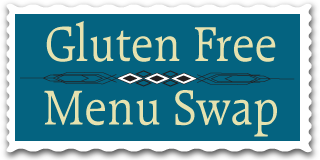 By the way, this week’s Gluten Free Menu Swap theme is Holiday Treats. I am still debating whether I will be making any holiday treats this year. I will probably at least make some Buckeyes and chocolate fudge. But other than that, I am trying to avoid them this year. Although, I have a feeling that the closer we get to the holidays, the more I will want to make a few things. Be sure to check out Angela’s Kitchen, where Angela is hosting the menu swap. This post is also linked to OrgJunkie, where you can find hundreds of meal plans, some of which are gluten free, some not. Enjoy! I am officially back on the wagon! Yay! And tonight I didn’t want to make anything but hubby was encouraging and so I followed my plan. Whew. Cause it’s too early in the week to go off plan! Save that for the weekend, right? Thanks for stopping by. I am with you on having only a few treats planned, but I bet when my daughter gets home from college that plan will change. Have a great week. I vote for the Buckeyes – yum! I saw a bunch of other yummy treats on your list, too, starting with the fudge. Mmmmm hmmm.